Sort of. They've been around for a while, but I haven't been able to upload anything of them. The full sketch pages this and the images following this came from were too big for IB's upload limit, and my computer's graphic card isn't good enough to render the entire page in SAI either, so I was unable to dissect them myself. 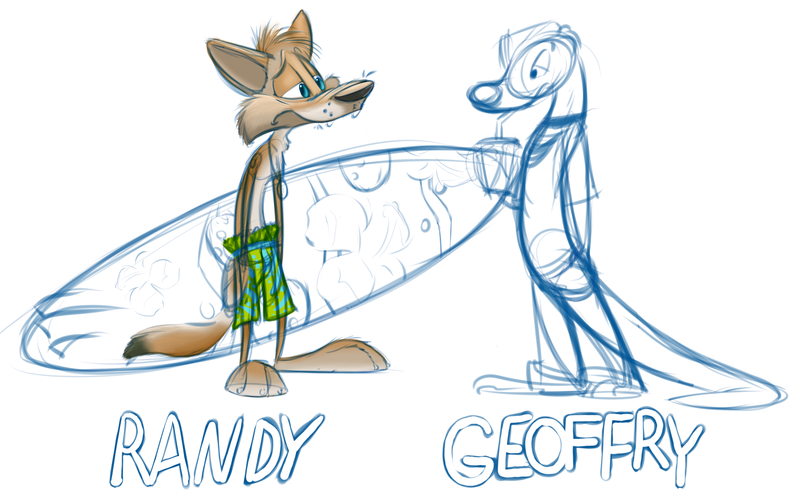 Anywhore, this is Randy (the yote on the left) and his best friend, Goeffry (the otter). They're both teenagers, not quite a year older than Ampersand (making them about 15-16). Randy's a skilled surfer, able to ride the biggest and baddest waves without trouble. The occasional wipe-out doesn't both him, because he knows he can get back up and try again. He's also an incorrigible womanizer, applying his same surfing philosophy to the task of finding a chick. He thinks he has game, but always falls flat on his face, usually after getting slapped. It never dissuades him from trying, though. Geoffry, or Geoff, is more the intellectual type. He's very well-read, and well-adjusted enough to not abandon Randy during his various escapades. He likes the "punk" style, clothing and hair included, but does not subscribe to the lifestyle. He never goes anywhere without a pocket-sized book or two, an easy task given the size of the pockets in his pants. Geoff possesses feelings of unrequited love towards his friend, but doesn't let them get in the way of their friendship. He's well aware of Randy's sexual preference.